is an important source of food for the Ithaca community, including for families in need. West Haven Farm is a fully equipped turn-key operation located two miles from downtown Ithaca. The farm encompasses 10+ acres protected by an 8-foot-tall woven-wire high-tensile deer fence, with additional acreage outside the fence. Structures include four hoophouses, an energy-efficient automated greenhouse heated with natural gas, and a well-built barn. West Haven Farm has been in operation since 1992 and certified organic by NOFA-NY since 1995. The business, equipment, infrastructure, improvements, supplies, markets, goodwill, and long-term lease are for sale. 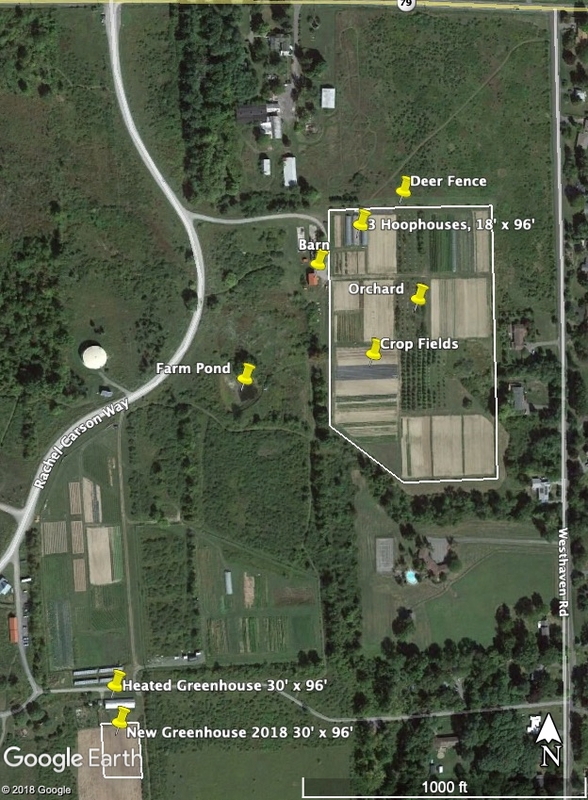 The land we farm is owned by EcoVillage at Ithaca (EVI Inc.) and is held in a permanent conservation easement by the Finger Lakes Land Trust- it may only be used for agriculture and education. There is a tremendous amount of community support for the farm from the wider Ithaca community and from within EcoVillage —many of the hundreds of residents have chosen to live at EcoVillage specifically because of the proximity to farming. The new farmers will need to be able to work closely with the EcoVillage community, including communicating about farm happenings, and ensure that residents have an opportunity to purchase the produce. A group of village residents has stepped forward to facilitate the transition and assist the new farmers. Living in one of EcoVillage's three co-housing neighborhoods is not a prerequisite for farming here, although we have found it convenient to live and farm here both. There are 100 housing units of varying sizes and prices, and there is regular availability of both rentals and units for sale. See https://ecovillageithaca.org/live/ for information about living at EcoVillage. There is a learning process for prospective residents, and the new farmers would need to participate in that process if they decide to live here. The farm is on Howard Gravelly Loam, an excellent and well-drained agricultural soil. Portions are flat and portions are on a slope. The steepest areas are best suited to orchards, we have left the flatter areas open for vegetables and strawberries. Soil tilth and fertility are very good. Compost is regularly applied and there is a robust cover cropping program. As we have embarked on our retirement from farming over the past few years, we have reduced the acreage planted to vegetable crops and focused on growing cover crops in most of the vegetable fields. In 2019, cultivated fields are primarily in clover, rye/vetch, and oats, with less than 1 acre of vegetables and strawberries. Because the soil is well-drained, irrigation is essential. The farm lease includes use of a pond which has been drained, dredged, and deepened within the last 10 years. The pond has just enough water to meet the needs of 10 acres of vegetable crops in a dry year; we have relied on drip irrigation to ensure efficient use of water. In addition, there is municipal water at the barn and at the greenhouse. Three of the hoophouses can be watered with either pond water or municipal water, the greenhouse and the new large hoophouse run on municipal water. It is possible to water farm fields with municipal water, but it can get expensive. We don't like weeds to compete with crops for water, light, and soil, and have pursued an aggressive weed control approach over the years. However, we still have to deal with particularly noxious weeds that are difficult to control by cultivation and rotation. Bindweed can be a problem in some of the perennial areas. Occasionally it has been necessary to pull bindweed off young orchard trees while they are getting established. In annually cropped areas, we have found purslane and galinsoga to be especially annoying, because they are hard to kill by cultivation. Heavy mulching with straw or use of landscape fabric can be effective, and we try to plan the rotation so that areas with more weed pressure are planted to one or two-row crops that are amenable to mulching, such as tomatoes, squash, peppers, and eggplants. We’ve become interested in working with the Bionutrient Food Association to learn more about how that approach could inform practices at West Haven Farm; there may be support to send the new farmers to a workshop or conference. We've spent years developing and refining systems that help us run the farm in an efficient and organized manner, these systems make the farm the success it is today. Systems are in place for ground preparation, seeding, transplanting, cultivating, harvesting, marketing, office management, and more. While we expect that the new farmers will modify the existing systems and/or develop new ones, we will ensure that as part of the sale the knowledge base that we have developed is transferred as much as possible. We are eager to support the right buyer's transition in order to maintain the success of this enterprise. Since the farm reached its current size in 2001 we've divided the fenced-in area into ½ acre blocks. Each block has about 20 beds which are 200 feet long. The beds are 5’4” wide, allowing the tractors to straddle them and still have 4' of growing space with our standardized row spacing of 3 rows, 13” on center. We will be able to share our well-maintained planting records with the new farmers. West Haven includes great opportunities for season extension: the farm includes an automated 30x96 greenhouse with an energy-efficient natural gas system that heats benches and beds, where we have developed a successful year-round microgreens program. In addition, there are three 18x96 unheated hoopouses, and one 30x96 unheated greenhouse that’s ready to install in-ground heat to enhance winter production. The established 2-acre certified organic stonefruit and apple orchard, one of the first in the region, has been expertly maintained and is in full production. The orchard manager is open to staying on after the sale, if that fits with the new farmers’ plans. Current value-added products include apple cider and sauce, and there is great opportunity to expand. We will review detailed farm income and expenses directly with interested and qualified parties. When the farm is at peak production we typically hire a full-time seasonal staff of 3-4, 2-3 part-time helpers, a part-time year-round orchard manager, and a year-round farm manager. In addition to the paid crew, working shares from the CSA have been an excellent source of farm help and community-building. West Haven has been recognized for its socially responsible business practices: it was the pilot farm for the Food Justice Certification program and was the recipient of the Jeff Furman Award for Social Responsibility in Business. We seek buyers who share these values. Education has been an important part of West Haven farm, not only because of our own interest in promoting sustainable agriculture but also because of our unique situation so close to a college town. We regularly host tours of college students, graduate students, elementary and high school students, even pre-K students. We have hosted regional farmers, as well as tours of farmers from as far away as Japan and Norway. The USDA Sustainable Agriculture Research and Education program (SARE) led a tour at our farm. We have helped grow the scientific knowledge base of sustainable agriculture by serving as the field site for countless research studies conducted by faculty and students from our local colleges and universities. The following equipment, supplies, and inventory been carefully and expertly selected over the past 25+ years to perfectly suit the needs of the farm. This operation is ready for a new farmer to get started right away. Barn - Custom built, 24x36, 2 story barn with electricity, water, concrete floor, floor drain, shelving, FIOS, many windows, and amazing view of Ithaca, Cornell and Ithaca College. A solid, well-maintained, centerpiece building for the farm. Excellent space used for CSA pickup, workshop, crop drying, storage, summer office, and event hosting. Bathroom/Camera obscura - Custom built by an artist/carpenter/photographer, projects an upsidedown view of the outside onto the wall inside. Composting toilet (the compost cannot be used on the farm) and handwashing sink. Heated Greenhouse 30x96 Gothic Frame, double poly, automatic peak vent, roll-up sides, new high efficiency boiler, and dependable backup furnace on natural gas. Half the house has 4 independently controlled, bottom heated, rolling, galvanized growing benches. The other half has a flexible open space with potting table, 3 bay sink, rollup tractor door, and raised beds along the sides. The open space is good for extension of seedling area, crop and equipment storage, and heated winter workshop/crop processing area. Hoophouse 30x96 - New, double inflated poly, sprinklers, polycarbonate endwalls with sliding doors, and drop-down sidewalls for improved winter greens production. Heavy duty, and well graded for year-round use. Close access to natural gas for potential addition of heat. Kubota L4310HST w/loader & HST Trans. Field: trellis, row covers, etc. Tools: hand tools, harvest knives, hoes, etc. Marketing: bags, boxes, labels, scales, etc. Irrigation: pipes, fittings, T-tape, etc.